Especially when it comes to firearms. We have an inherent human right to self-defense by any means we deem appropriate, but this right has been checked and constrained by legal writ since time immemorial. From the Middle Ages where arms were denied to the underclasses so the powerful could stay in power, to today’s controversial statutes attempting to restrict guns, the concept of regulating and restricting arms is almost as old as civilization itself. However, I’m not here to debate the politics of those decisions. Instead, this article will focus on the legal vagaries of armed self-defense in the State of Florida. Though specific to this jurisdiction, the content herein may apply to other areas as well. Standard disclaimer: I’m not an attorney. If more concrete legal advice is required, a good place to start is handgunlaw.us. Florida’s laws concerning firearms can be found at Online Sunshine. The best way to approach this subject is in the “true/false” model, in my opinion. We’ll start with some obvious ones and work our way down. Relevant phrases are hyperlinked (not bolded) to more info. You need a permit to purchase a firearm. In Florida, and most states, you do not need a permit to purchase a firearm from a licensed dealer. This myth stems from states like New York where you have to ask the local authorities permission to buy a pistol. 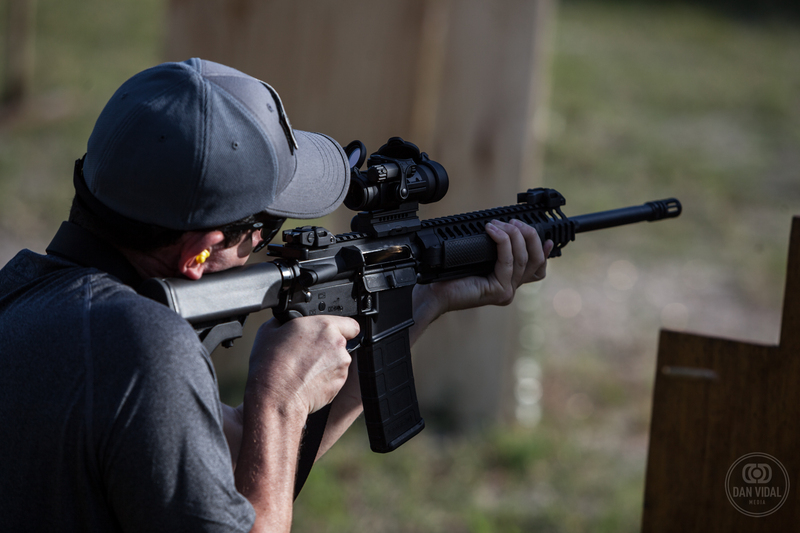 In Florida, all you need to do is go to your local gun shop, select which gun you want, (I recommend going to a shop with an attached range such as Nexus Shooting where they will let you demo many of their pieces prior to purchase…), fill out the ATF Form 4473, which the gun dealer uses the information you input on there to run the federally-required background check, and then the purchase is complete. Most Florida counties impose a 3 to 5 day waiting period on handgun purchases, so after that, you can take your gun home. Unless you have a Concealed Weapon or Firearm License (CWFL) aka a concealed-carry permit. If you have the permit, you can take your gun home that same day. Long guns (rifles and shotguns) are not subject to these restrictions. A private sale of a gun is illegal. In Florida, a private sale of a firearm, i.e. when a person sells a gun to another person, is legal. Except if the transferee (that’s fancy gun-industry speak for “buyer”) is a prohibited person under federal or state law, i.e. a person who has been convicted of a felony, a person who is known to be of limited mental capacity, and so on. Also, you cannot sell a gun to a person who resides out of your state of residence. For example, if you live in Florida, you cannot sell your 9mm GLOCK 19 to a resident of New York, even if they have a clean background. This is to avoid little vagaries like the fact that pistols need to be registered in New York, but not in Florida, and that the GLOCK 19 with a standard magazine is illegal for civilian use in New York. Ah, laws, what would we do without them? The clincher of course is that the seller has no access to the federal NICS (background check) system and thus cannot confirm the status of the person they are selling to. Most folks who do the occasional private sale usually only do it to friends and family, and avoid strangers for this reason. My advice, if you do a private transfer to an unknown person, ask to make a copy of their ID and record the transaction yourself. Most people just looking for a good deal on a gun will gladly provide. Also, remember that if you do private transfers frequently, you may be running afoul of federal law, i.e. selling firearms without a license. What that number is, I don’t know, and neither does anyone else. The ATF is pretty arbitrary on that. You could sell 3 guns a year for 20 years and then next year sell 4, and suddenly the ATF shows up at your door. Tread lightly. After I purchase my gun, I need to register it with the police/government. Florida has no registry of pistols or long guns. It’s also against Florida law for a registry to be established by any state or local governmental entity. I say “mostly false”, since if you possess a short-barreled rifle, a short-barreled shotgun, a machine gun, or a suppressor, after July 14th 2016, you will be required to notify your local chief law enforcement officer that you possess this item, on top of the other federal requirements to possess one of these items. Whether he or she is required to record this information or destroy it is currently being debated. This could change. However, for common firearms such as a pistol or a rifle, no registration is required in Florida. I need a permit to carry a gun outside of my property. In Florida, as a non-law enforcement civilian, you need what is called a Concealed Weapon or Firearm License or CWFL. You can see how to apply for one here. The license, when issued, allows you to carry a concealed pistol, or pistols (if you roll with a back up gun…), on your person in most locations. No-go zones include bars and nightclubs that serve alcohol, schools, most government buildings, and other places as defined in 790.06 section 12. Unlicensed carry off your property in Florida is generally prohibited, except in your vehicle or place of business as defined in 790.25. Vehicle carry generally requires the gun to be securely encased, and not just tossed under the seat, for example. Vehicle carry is a provision for self-defense, as well as covering gun owners who may be transporting their firearms to and from the range, a competition, and so forth. A new provision, 790.01 section 3a, allows for unlicensed concealed carry during a mandatory evacuation order, i.e. during a hurricane. This provision allows people to carry their firearms (concealed/encased) during an evacuation, as a safeguard to prevent theft from looters. My advice is to obtain your CWFL, as this clears up a lot of the gray areas in terms of carrying a firearm in Florida. Also, as I noted above, having the permit cancels out the waiting period when purchasing a handgun in the state. It’s like an “express card” for a gun shop. My employer can prohibit me from carrying a firearm while at work. Your employer can prohibit you from carrying a firearm at work as a condition of employment. The workspace is private property, and he or she can set the rules to be whatever they choose. The only current modification to that is that you are allowed to keep your firearm locked in your vehicle while at work, even if the parking lot is on company property. This is defined in 790.251. The reality of this is vague though. Most employers don’t have a specific rule about guns in the workplace. In that case, I do recommend not upsetting the applecart, as it were. Concealed is concealed. Dress accordingly and don’t do anything to make the employer think about guns in the workplace. Open carry is illegal in Florida. For all practical purposes, Florida is one of the few states that prohibits the open carry of firearms in public places by civilians. Whether it’s a pistol or a rifle, open carry is prohibited in all public places in Florida. Now, you can be on your own property and openly carry to your heart’s content. Walk around with a suppressed AR if you want in full view of the whole neighborhood. Just don’t cross your property line. Of course, your neighbors may call the police anyways. So exercise your open carry rights on private property with caution. An interesting quirk of open carry in Florida is that it can be done, as long as you are engaged in, or coming from or going to a lawful activity such as hunting, camping, fishing, or to and from a range/competition, as defined in 790.25. Of course, in this case, it’s up to you to prove that you are in fact within compliance of these conditions. Open carry campaigners in Florida regularly go to public fishing spots while openly displaying holstered arms as a form of protest and education with regards to the issue. I have to tell a cop if I have a gun on me. Florida is not a duty-to-inform state. If you are lawfully carrying a firearm in your vehicle or on your person and a police officer stops you for any reason, you do not have to tell him or her that you have a firearm on you as part of your introductory conversation. However, some people choose to hand over their CWFL with their drivers license as a form of courtesy. Some cops will care and make a scene over a lawfully carried weapon, some cops won’t. Regardless, comply with their orders if they tell you to do something with the firearm, i.e. hand it over temporarily. The general rule-of-thumb in Florida for “the courtesy” is that it is OK to tell a rural cop you are armed, whereas an urban cop, raised in a more anti-gun environment, may react with hostility if you inform him of your carry status as a conversation starter. The jury is still out on what to do if a cop acts disrespectfully towards you or your firearm. There’s been scattered reports of cops disassembling pistols out of sheer bravado, etc. Document it and file a complaint with the citizen review board would be my ten-second advice. However, if a cop does ask you if you have a weapon on you or in your vehicle, you must answer in the affirmative if you have a weapon. Stand Your Ground means I can blow people away with any excuse I want! And provably so. Any one can invoke 776.012 section 2 if they shoot someone. However, it’s up to the courts and juries to determine if that invocation is warranted or not. 776.012 section 2 is of course the oft-debated “Stand Your Ground” law. That’s legalese for you. Again, I’m not an attorney. I do not want a 3 AM phone call from a police officer saying you “read it on Regular Guy Guns Dot Com” if you shoot someone. Have a real attorney handy instead. But anyways, this statute basically does away with the “duty to retreat” provisions prior statutes called for. If you feel that your life is threatened, in any place that you are lawfully allowed to be, you can utilize deadly force to defend yourself. For example, if you are walking down the street, and an assailant attempts to rob you and physically assaults you, you can use your gun to stop the attack, regardless of whether the assailant is armed or not. The theory being that one could be mortally injured in that situation, i.e. he smacks your head into the ground, fracturing your skull. Now, if you are engaged in a criminal act, i.e. if you are on the street and buying dope, and someone attacks you and you decide to shoot them, you cannot lawfully use your gun, since you are committing a crime yourself, and you are not “lawfully allowed” to be where you are. Nor can you shoot someone, for example, that may have issued threats via the internet, for example. If Joey posted “Hey DV, I hate half-breeds and I’m going to kill you when I see you!”, I couldn’t hunt him down and shoot him. He didn’t present an immediate threat to my safety. Instead, I’d get Joey’s IP, and call the cops and forward them the information. And I’d be hella cautious (yes, I said “hella”) and have my sidearm with me at all times just in case. But I couldn’t legally go after him. SYG gets a bad rap since anyone can invoke it during a trial. And people do. Those are the breaks with a liberal (in the classic sense) law, sometimes people will frivolously invoke it. Reminder, again - I’m not an attorney. Sorry for berating this, but SYG is a tricky subject and it bears repeating that this is my analysis of the statute. The statutes are vague on this one, but case law in Florida and elsewhere has determined that we defend ourselves with force to stop the threat, not to kill the threat. It’s a fine line, but it’s a very important one nonetheless. Whether you are defending yourself during a home invasion, or on the streets from an assailant, your goal is to stop the threat. The fine line occurs if the assailant dies in the process. If your initial volley of shots prove fatal to the assailant while he is in your home unlawfully, or attacking you, then you most likely will be OK in the legal sense. For example, you fire, and your rounds strike a vital area. Or if the assailant “bleeds out” before medical assistance can arrive. However, you are not allowed to deliver the “coup de grace”, i.e. a headshot. Executions are not legal and you will take a ride and probably won’t beat the rap. Advice if this happens. Be the first to call 911. State where you are and that you were attacked and you defended yourself with force. Then hang up the phone. When the cops show, make sure your gun is stowed and only provide them with your identification, and that you will only make a statement in the presence of an attorney. A more detailed legal analysis of this situation can be found in Wes Denham’s great article. If I get a concealed weapons permit, people can go online and find out if I have one. False, unless the requestor is law enforcement. Of course the police can access the Florida Department of Agriculture and Consumer Services’ database of CWFL holders. However, the cops need good cause to do so. Officer Friendly can’t just do a query because he’s bored. Those transactions are logged and he has to justify each one. But for people like you and me, those records are exempt from Florida’s Sunshine Law, which codifies what can and cannot be requested during a public records search. It used to be that the database of CWFL holders was searchable online by the general public, but abuses of the system by the media (Francisco Alvarado of the Miami New Times did a hit piece titled ‘Bullet Time’ once on CWFL holders in South Florida, and listed some of their names in the article. The article has been pulled, presumably to comply with the law…) led to Florida Statute 790.0601, (that’s a lot of significant digits…) which exempted CWFL data from public records requests. I’m very averse to convoluted laws, but this one I can appreciate. The decision to own and carry a firearm is a personal one, and it is no one’s business but your own, and those whom you choose to tell. I probably missed something. I may have misinterpreted statutes. These are my opinions and not legal advice. Regard this as a great starting point and not a substitute for a real attorney. Knowledge of the law is something every Regular Guy and Girl who is into firearms should possess. We may not agree with most of the laws, but if we’re to stay on the right side of justice, knowing them is critical.